Check out these latest Pullerbear videos. If you've ever wondered what the invasive weed's view is like when it's offspring and relatives are getting pulled out of the ground by their family roots. This might give you an idea. This demos the efficient operation of the Pullerbear Pro XL. No stooping or bending down and a jaw that doesn't go slack when the pulling isn't done. The only tree puller that doesn't let go until you want it to. 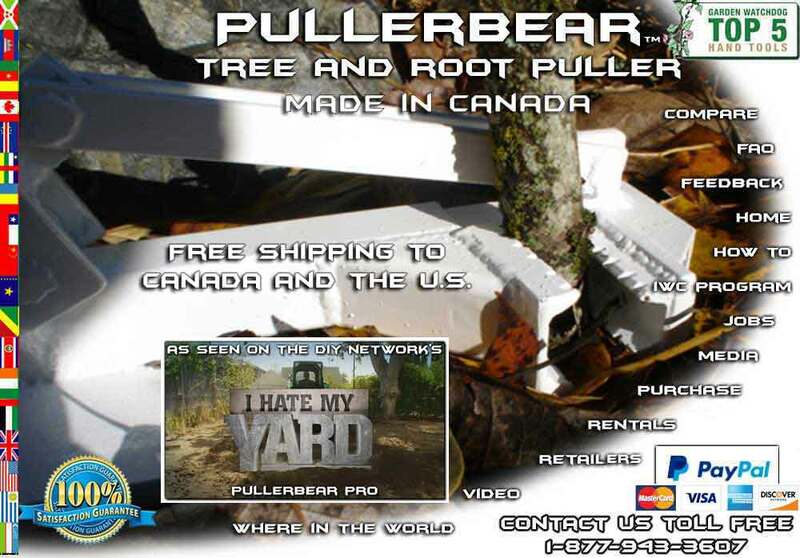 The Pullerbear Pro XL, Grip XL, Pulls All and 2 in 1 are the only tree pullers anywhere that provides a method of expanding the base if you find yourself in soft soil conditions. For the cost of 4 screws and a piece of scrap wood...no more sinking feeling. A distinct advantage, of many, that the Pullerbears have over all other tree pullers is that the Pullerbears need just the tiniest of nub to grab onto to to uproot a plant. Other tree pullers need at least 3 to 4" of stump to even begin the process of extraction. Whoever thought three inches wasn't an advantage has never used a Pullerbear Pro XL before. You can often get trees that have multiple stems that occur naturally or because they been cut off and now have branched out. The 3" jaw capacity solves this problem as the jaw can grab 3 to 4 stems at a time. The largest capacity jaw of any tree puller anywhere.